Approved Mother's Day Gift: Tough Cookies! In Texas, the Tyler Paper reports that The Girl Scouts of Northeast Texas recognized two women during its annual awards luncheon. “I believe that every time a girl becomes a Girl Scout, the community becomes stronger,” Colleen Walker, chief executive officer of the Girl Scouts of Northeast Texas, said during the event. Ms. Walker thanked the many volunteers who support the organization and invest in young women. She also acknowledged the schools and the support they provide. The Northeast Texas Girl Scouts is kicking off an almost $1 million capital campaign to improve its existing office space located on about 13 acres along U.S. Highway 271. The organization already has received a $50,000 anonymous donation. Kathy Cloninger, chief executive officer emeritus of Girl Scouts of the USA and author of the book “Tough Cookies: Leadership Lessons from 100 Years of the Girl Scouts,” served as the keynote at the awards luncheon. Ms. Cloninger spoke about the importance of gender balance in leadership and the role the Girl Scouts can play in that arena. “Gender balance in leadership is essential for the future of this nation to remain strong as a leader among nations,” she said. She said only 16 percent of elected officials in Congress are women, 15 percent of corporate board room seats are held by women and 3 percent of Fortune 500 companies are led by women. 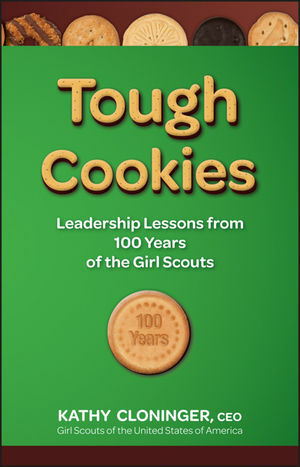 Tough Cookies is the story of Girl Scouting's 100-year legacy of developing ethical, confident leaders, and about girls and young women who are already proving they can make their country and this world a better place. All proceeds from the sale of Tough Cookies go to Girl Scouts of the USA. By buying your copy today you are helping us support our nation's girls. Tough Cookies is Girl Scouts of the USA's pick for the perfect Mother's Day gift this year!